Boy oh boy, do I have things to share with you today, readers! 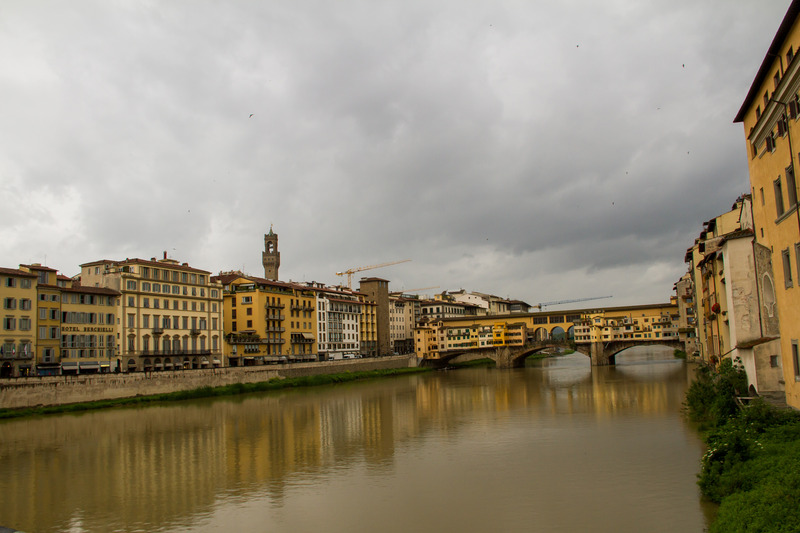 We just returned from an 8-day holiday in Italy, and it was absolutely wonderful in every way possible… You may have guessed by the title and your knowledge of Italian food, we ate pretty well on this trip!! 🙂 Today, I shall give you a little detail of the beginning of the journey. 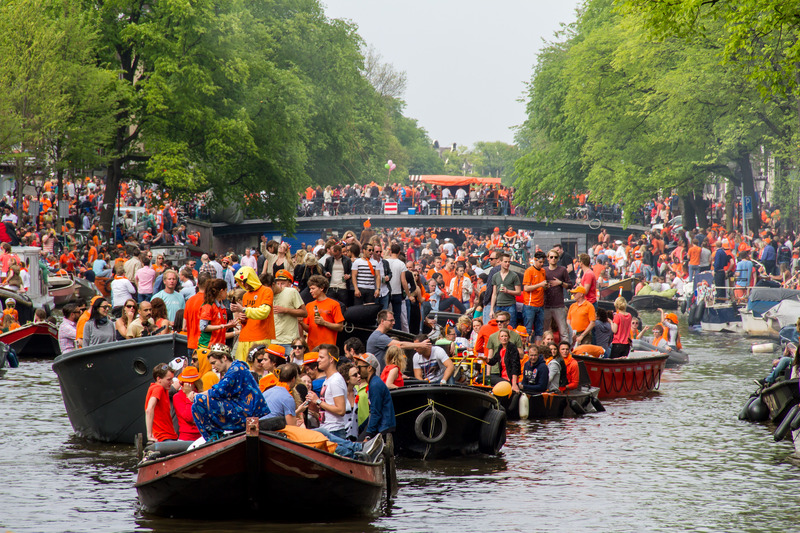 But first, a quick couple of photos of King’s Day, which was a few weeks ago. 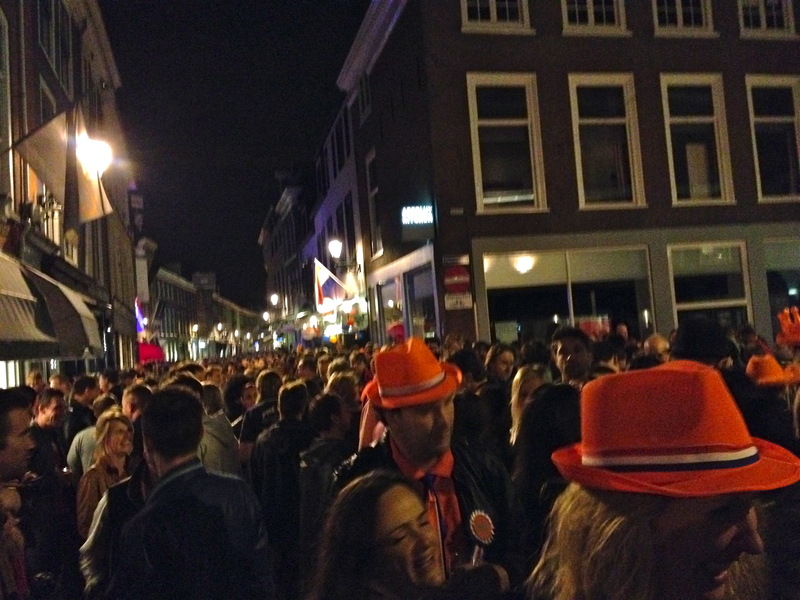 We celebrated Friday night in Den Haag, where the “King’s Night” celebration kick starts a fun weekend. We went out to dinner with our friend, Ben, who came up from Paris again this year and also our friend, Jan, and his crew. 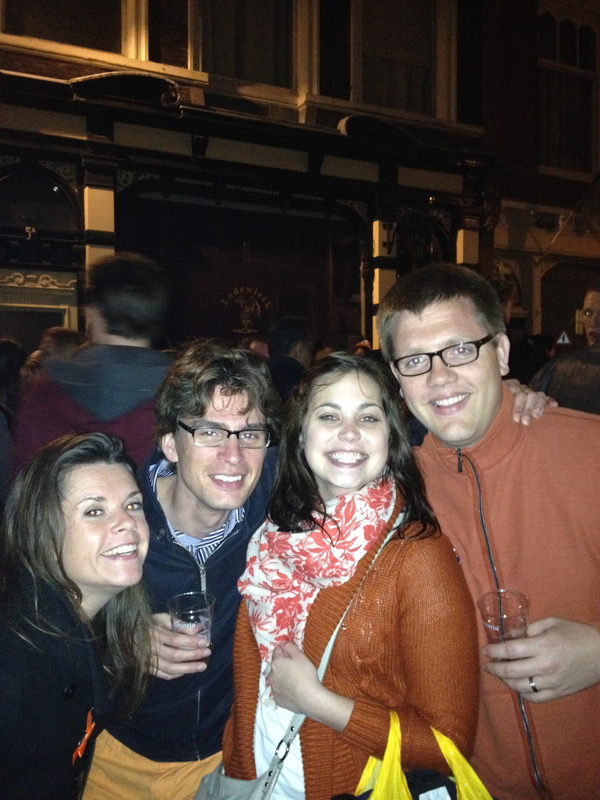 After dinner, we made our way around town through the various concerts and carnivals going on. A great time was had by all! Having a great time on the Denneweg! 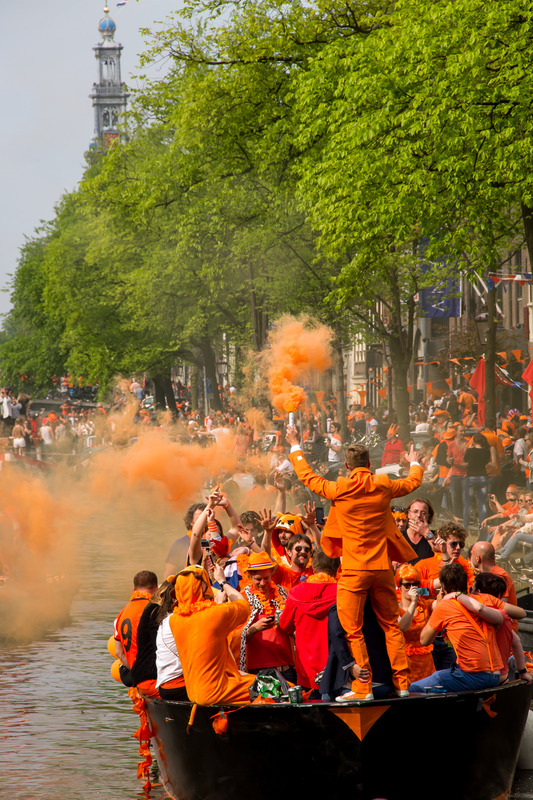 There were a few other people out to celebrate! I really liked the tulips in the water! Not a great shot, but gives you an idea of the walls. 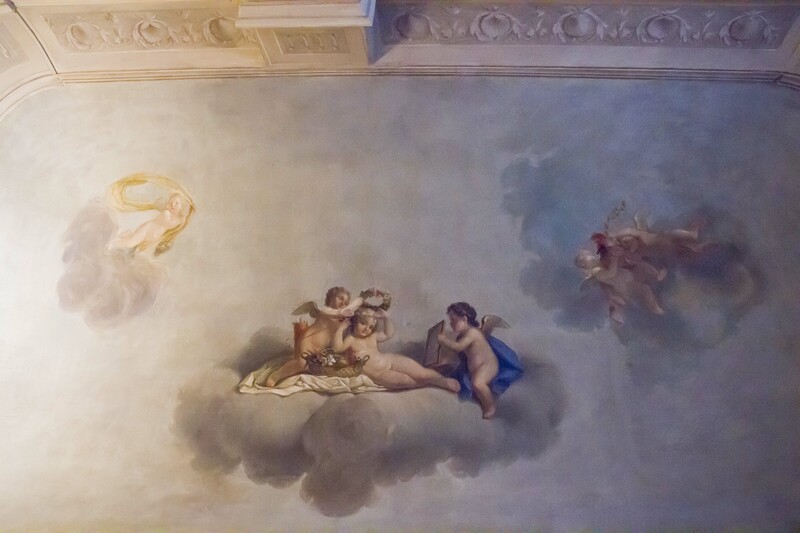 This is the ceiling above our bed! Literally, angels watching over us. When we arrived, the weather was not ideal. The guy at the hotel recommended a nearby square to grab a bite to eat, so we took the opportunity to not wander about in the rain! 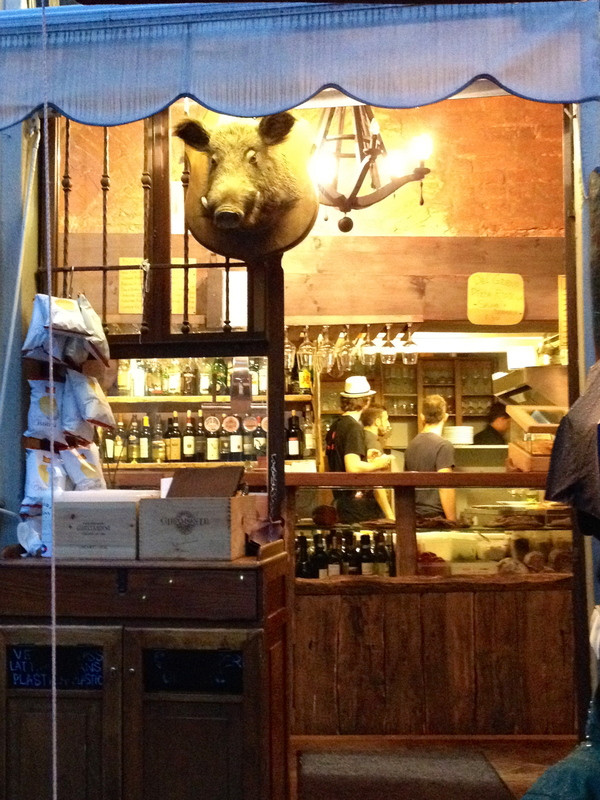 We settled in under an awning and had some appetizers and panini’s…a good start to a trip full of tasty food! This was the place of choice! Gusta Panino. 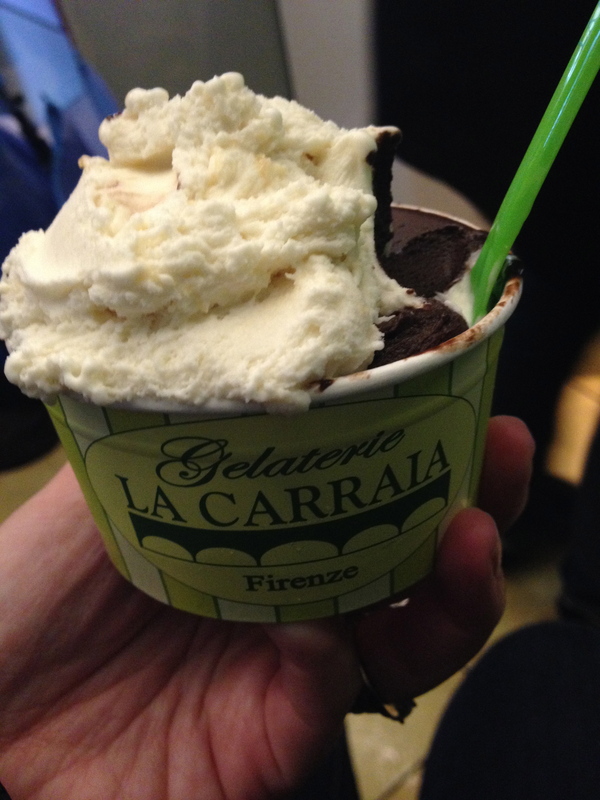 Then, we had read about the BEST gelato shop in town being very close to our hotel, La Carraia. We naturally decided to investigate. It was indeed AMAZING! My excitement level was high. Almond and Dark Chocolate…a brilliant combination. 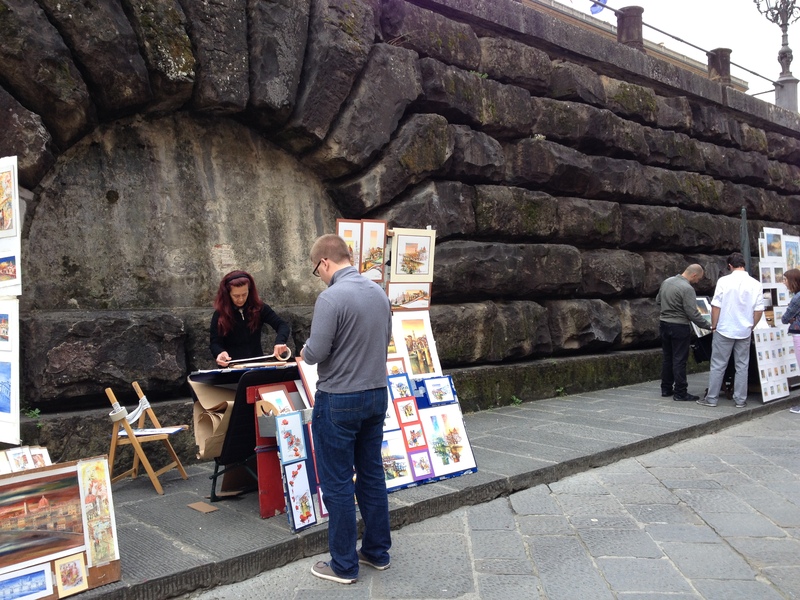 Saturday was basically our only day to see Florence, so we hit the ground running (despite the again nasty weather). 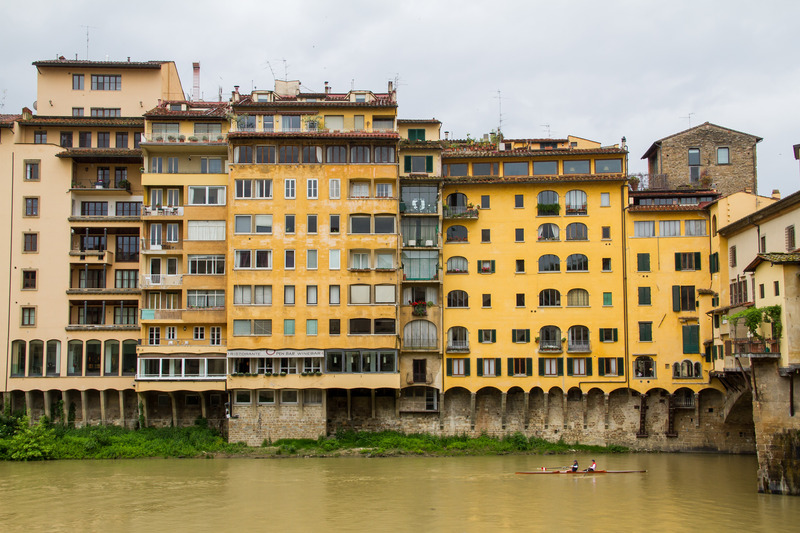 We checked out the Ponte Vecchio first. 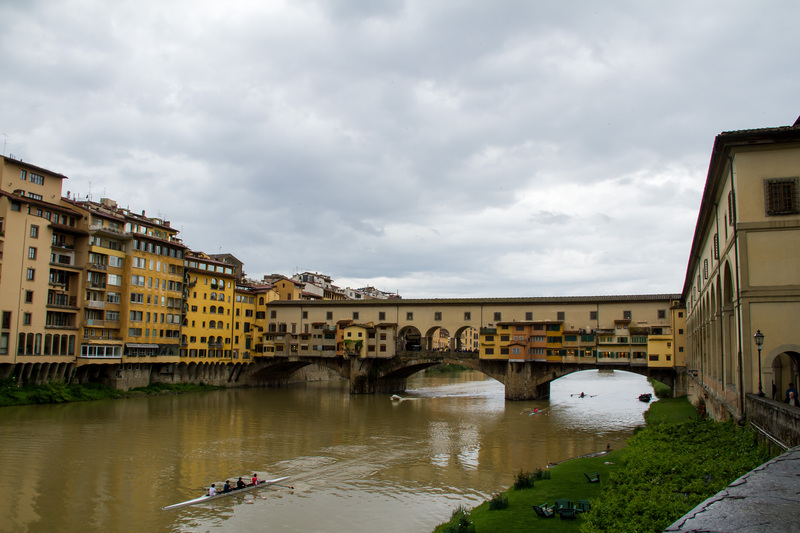 The Ponte Vecchio is an old Medieval bridge across the river, which is still lined with shops. It’s a pretty rustic looking bridge, but I really loved the look. At that point in the day, the shops were closed, so traffic was light. We revisited later in the day to cross the bridge, and it was packed! From the other side. 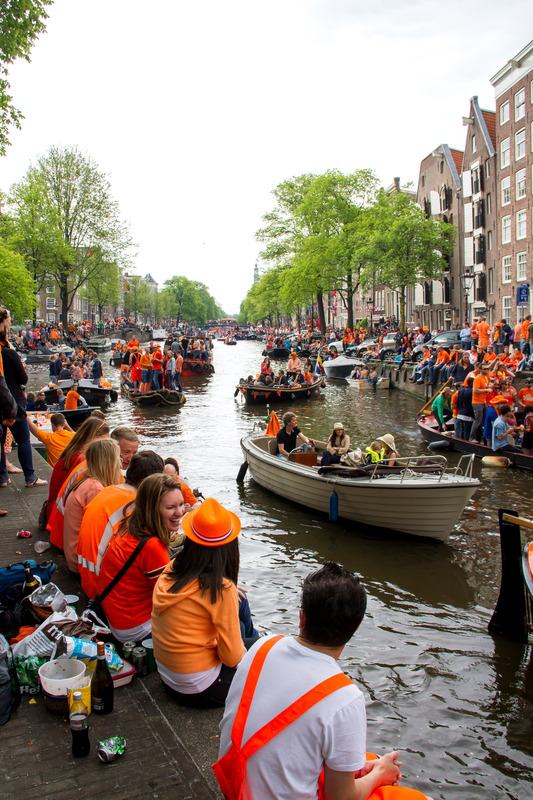 Apparently a popular rowing spot. 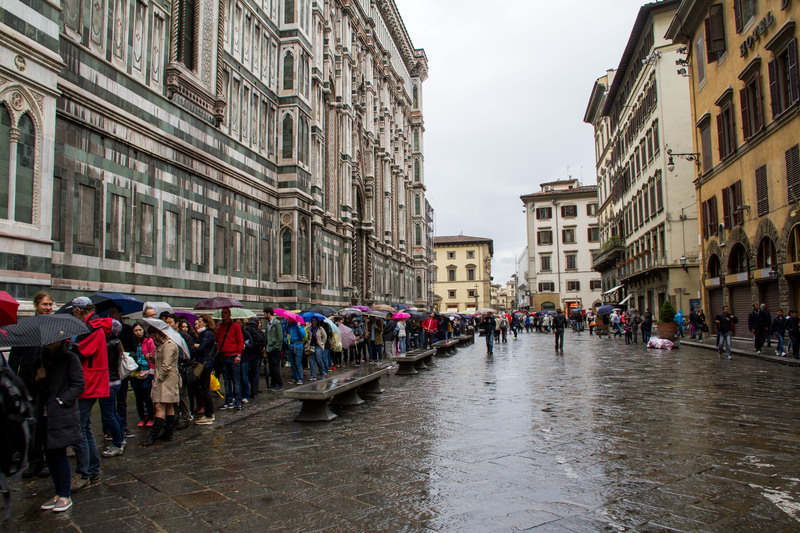 From there, we did a quick look at the line at the Uffizi Gallery, one of the most famous art museums in the world, containing works by some of the most known Italian artists (Michelangelo, Leonardo da Vinci, Raphael – just think Ninja Turtles…) Unfortunately, the line was too long to wait, since we had only one day to get around. 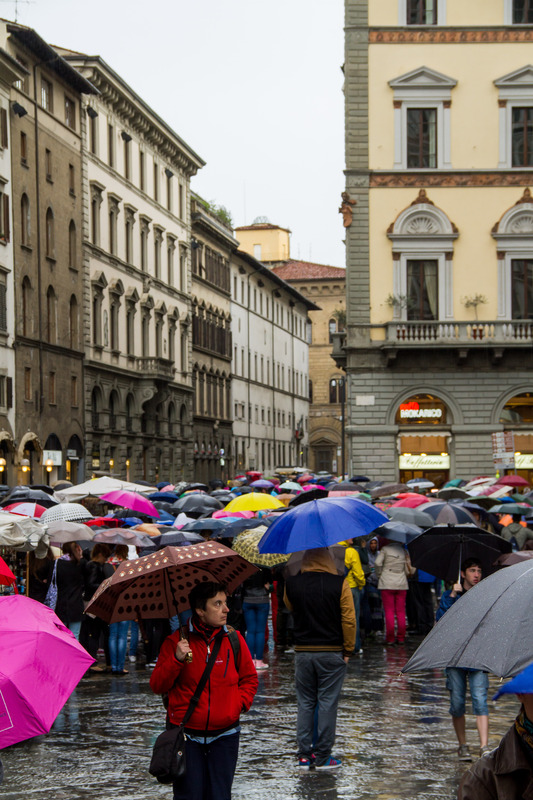 Apparently it was Labor Day weekend in Italy, so there were a lot of people out and about! Next up, we visited the San Lorenzo and Central Market. 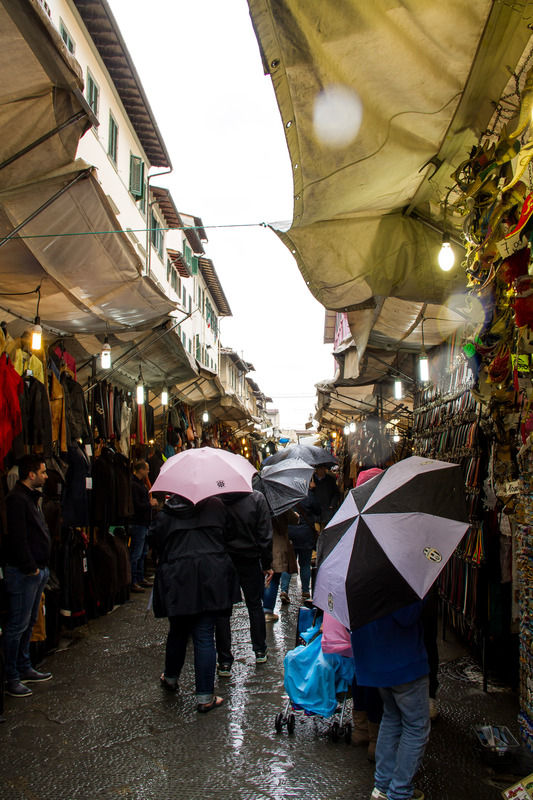 The San Lorenzo market is pretty much the same as all the markets around here…people selling their products of not particularly great quality and many of the same things over and over. Always worth a stroll though. But then we went inside the Central Market (a good indoor activity – break from the rain), which is a food market: fish, produce, meats, cheeses, spices…everything! 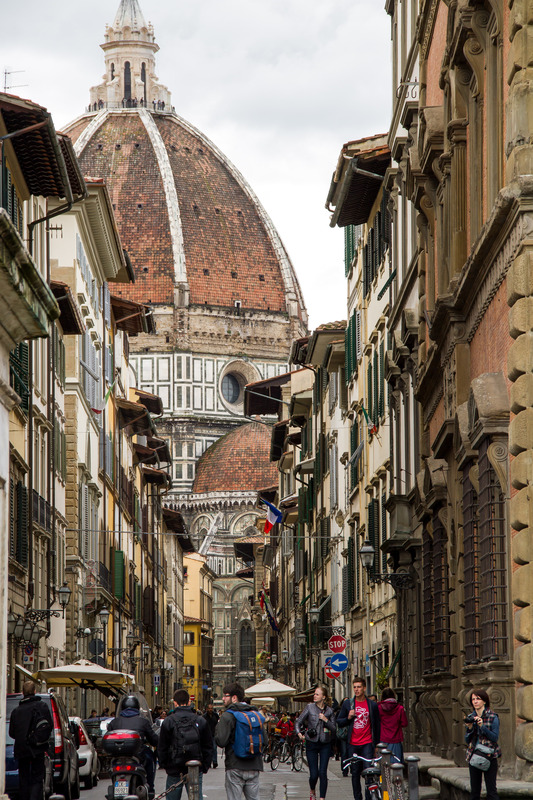 This seems like it would be a fun place to do your shopping, if you lived in Florence! 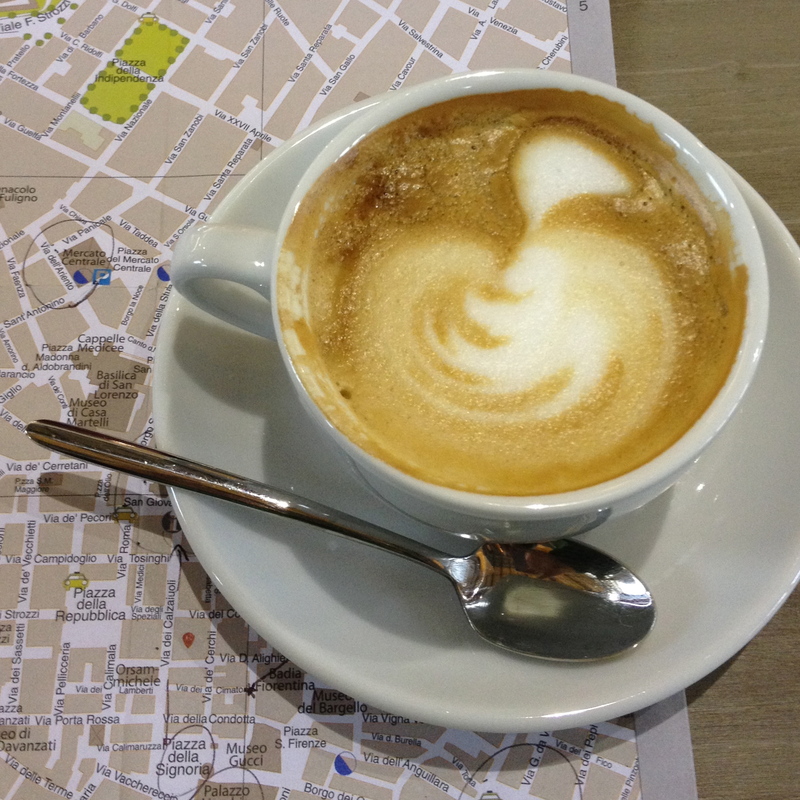 We went to the second level of the market, where there were cafes, and enjoyed a cappuccino. 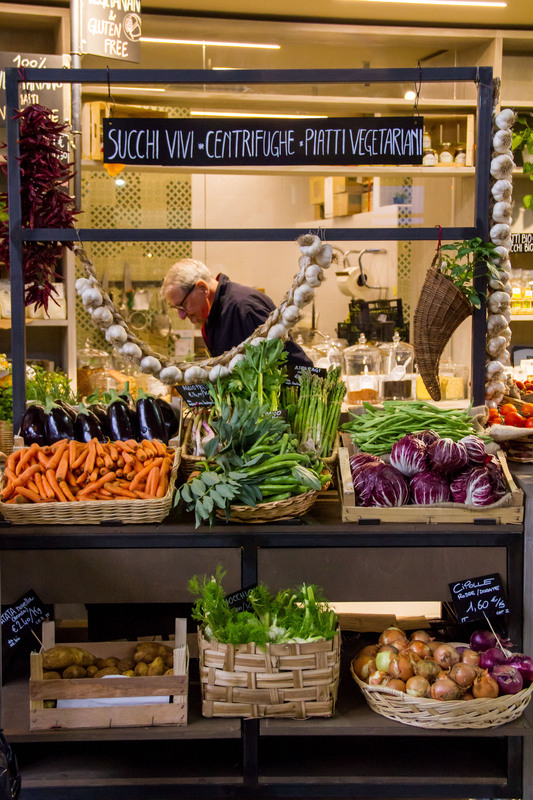 A nice vegetable display in the Central Market. Mmmm…Italian coffee. 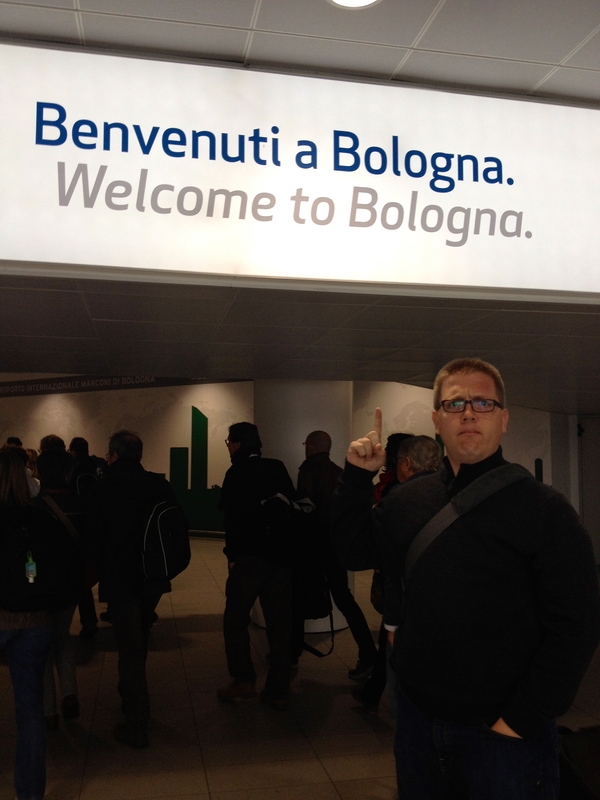 BC was proud of this photo, which includes the location of the market on the map…fancy! 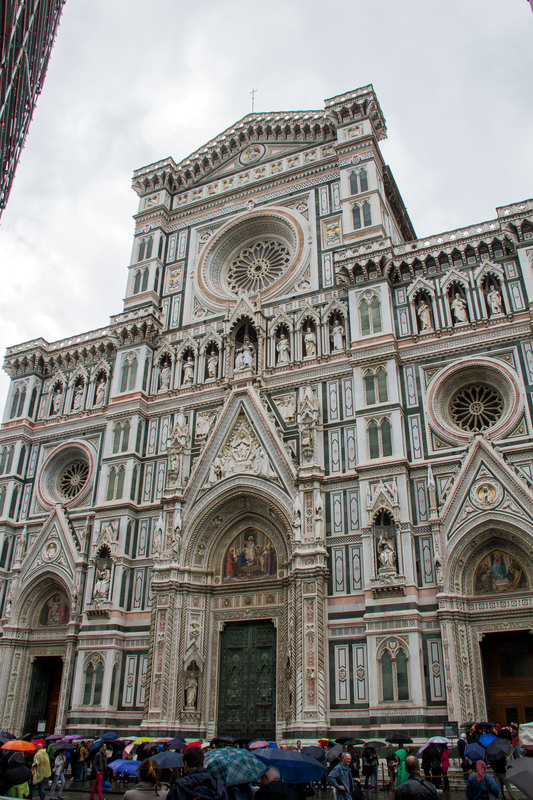 From there, we aimlessly wandered around, snapping a few photos here and there before lunch. 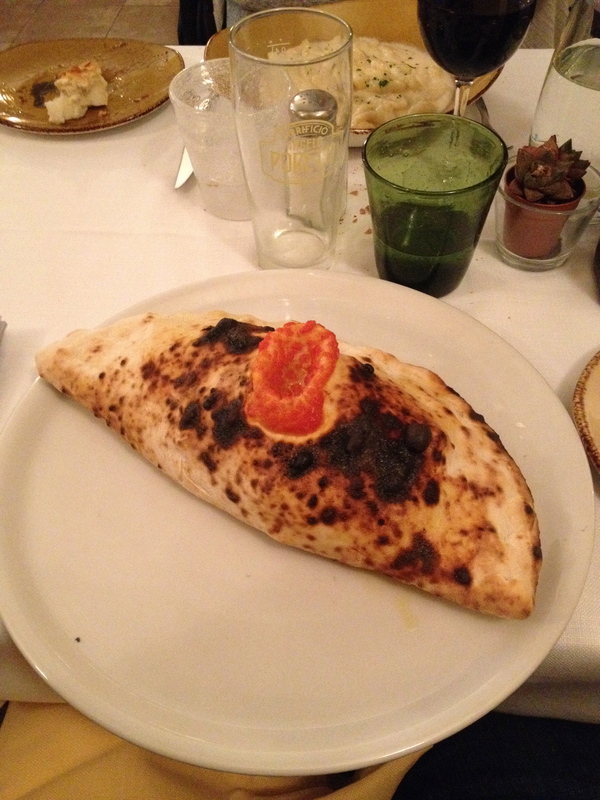 Then we headed to Restaurante Accademia for lunch, based on a food bloggers recommendation. It turned out to be a nice place. 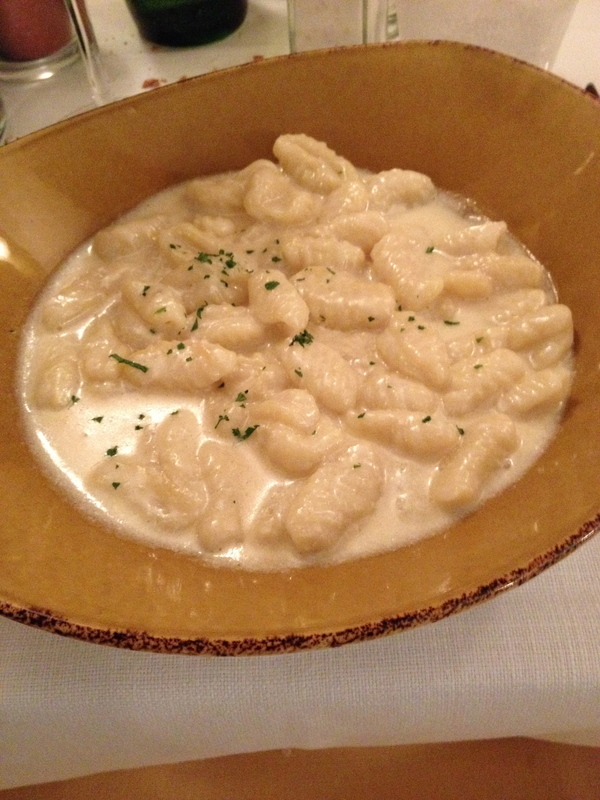 I had gnocchi with a cheese sauce that can only be described as heavenly…and BC enjoyed a calzone. 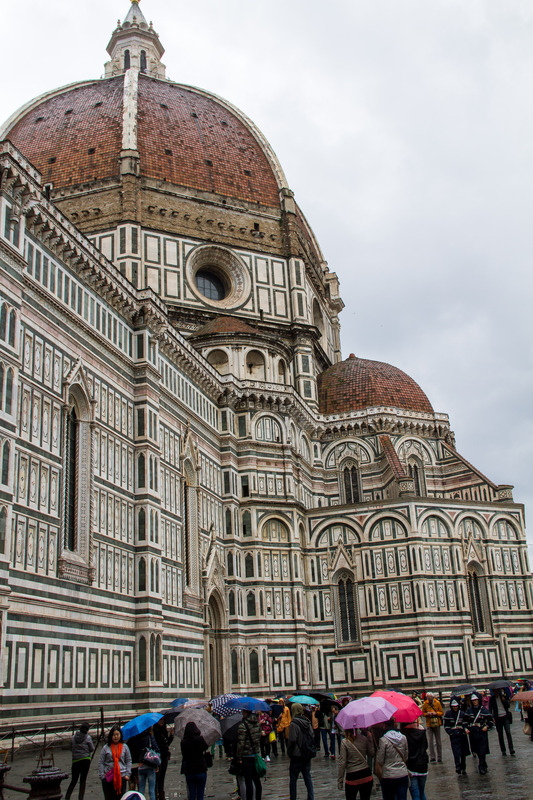 Random photo – Duomo spotting! Random photo – An umbrella amongst umbrellas. 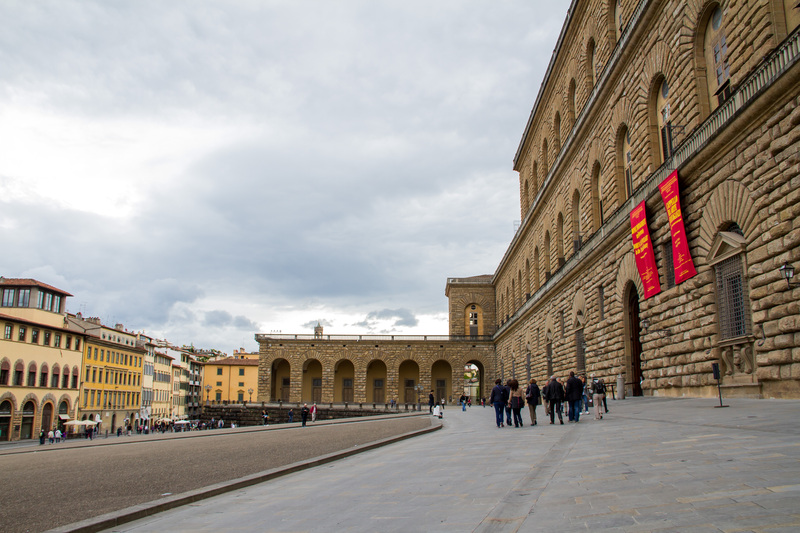 After lunch, we did the only activity we had actually planned for and reserved in advance of our Florence visit…the Accademia. 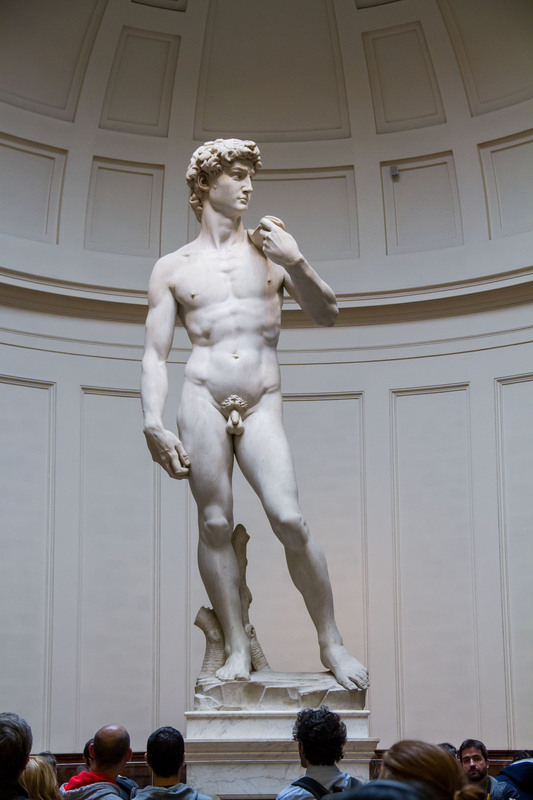 We came here (like most people) for one reason only, to see the David. You have probably heard of or seen photos of this marble statue depiction of the biblical character David by Michelangelo…it’s quite famous. It turns out you couldn’t take any photos in the museum, but both BC and I realized that after we had snapped a few…so you’re really lucky, people! Hopefully I won’t get in trouble for posting this! 🙂 We were impressed with the level of detail in this sculpture – pretty cool – of course, we should probably expect that from a “masterpiece,” right? 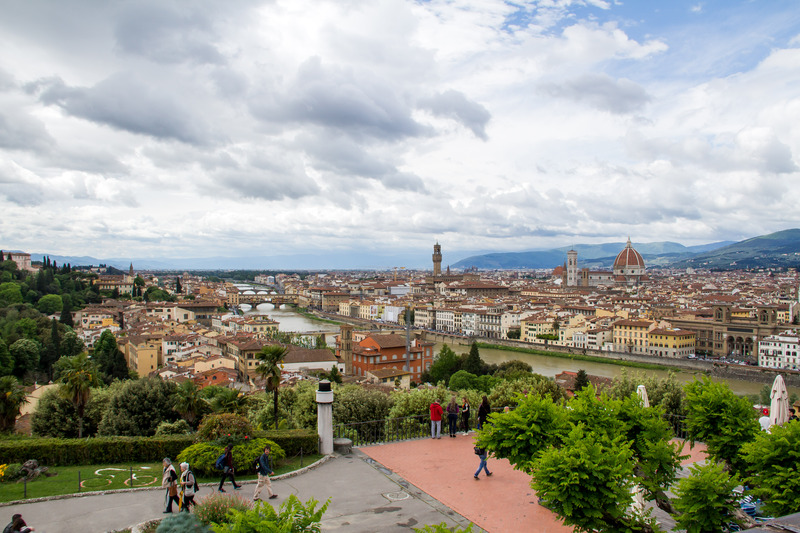 Next up on our list was the Piazzale Michelangelo – an open square overlooking the entire city. 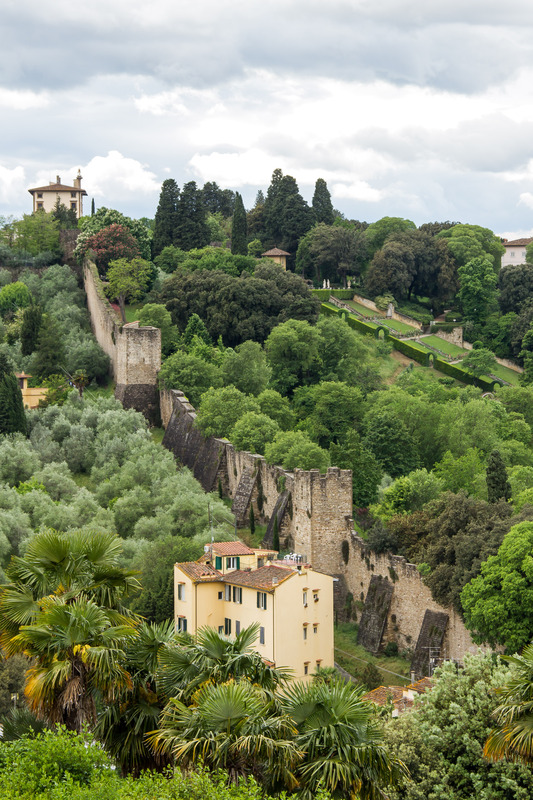 We saw it described as the patio of Florence… It was an uphill journey, but the climb is almost always worth the view! I was not disappointed. 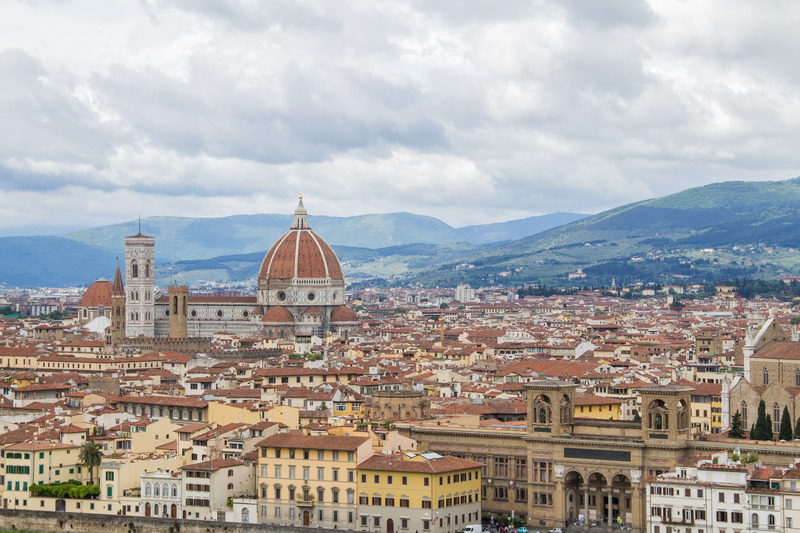 A nice view of Il Duomo and the red roofs of Florence. A quick shot of us now that the sun was out and we were dried off! 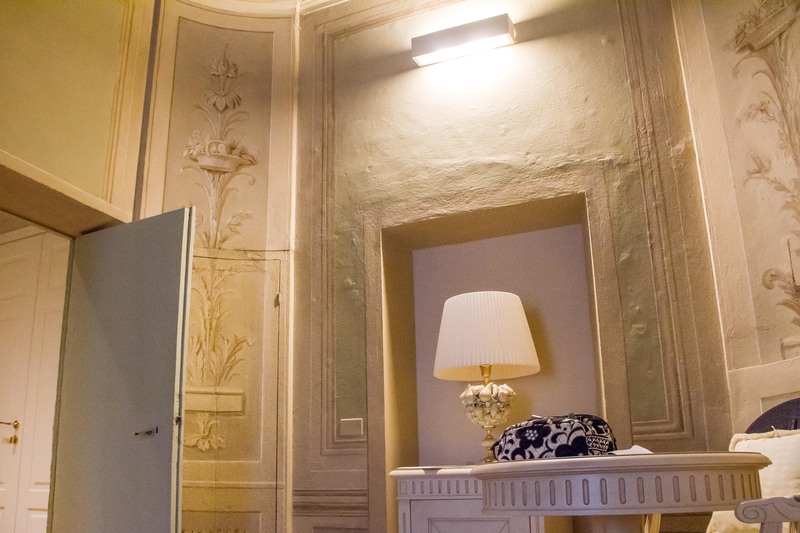 That night our hotel had made a reservation for us at a local, traditionally Tuscan restaurant for dinner. 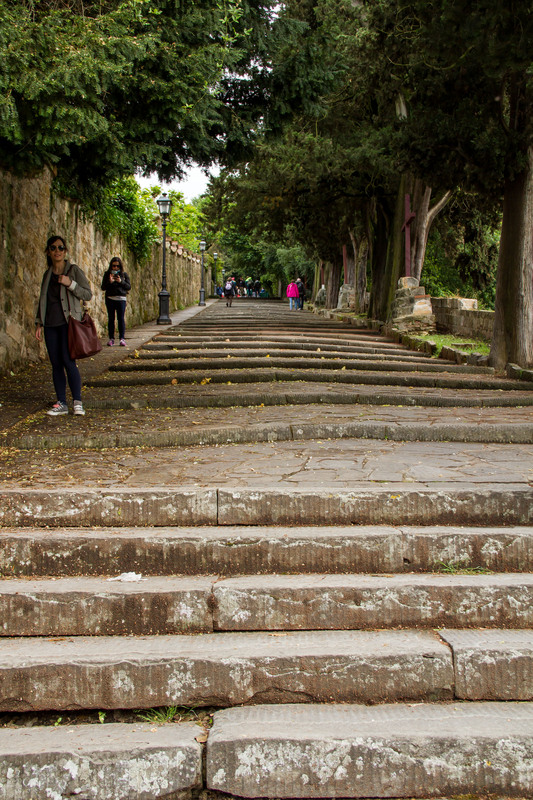 This was not a place packed with tourists, which is usually a good sign! We started with some house chianti and a mixed plate of antipasti (appetizers): meats, cheeses, olives, bruschetta, some fried vegetable thing, and chicken liver! I was nervous about the chicken liver, but the guy said we had to try it. It really wasn’t bad – kind of tuna-ish tasting to me. 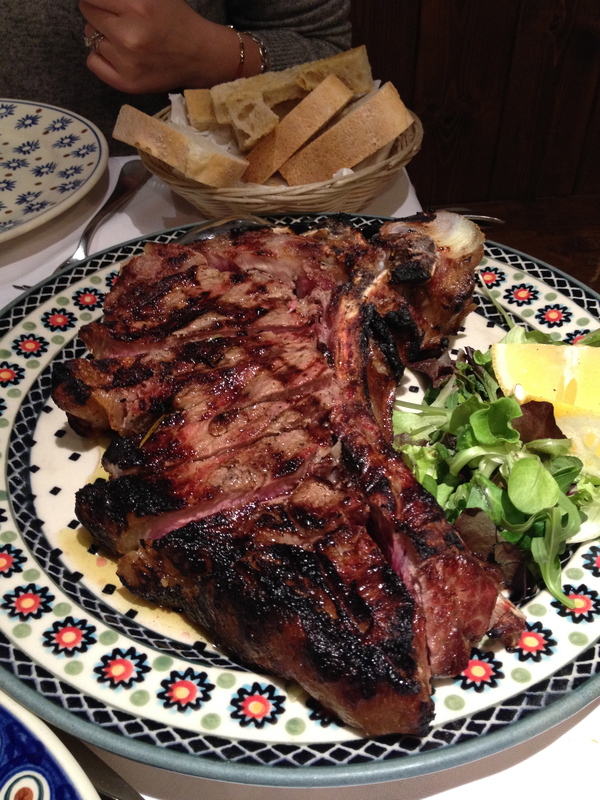 Then the highlight of the night was the main course…a 1 kilo T-bone steak to split between us. That’s a conversion of 2.25 lbs…but I’m telling myself the bone was at least 1.5 lbs. 🙂 This is what everyone was ordering – must have been the right choice! Don’t worry – we have a photo. This is for all my Iowa steak lovers. One would assume that we were too stuffed that night to get another round of gelato…but you know what happens when you make assumptions! 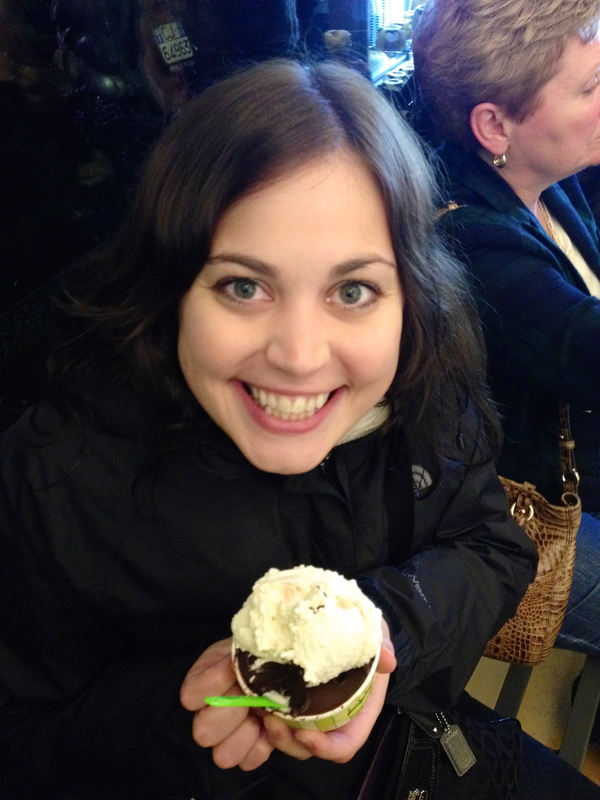 We did re-visit the most amazing gelato shop ever…and it was packed! I opted for a lighter lemon & berry sorbet option this time around…and this is where the lemon sorbet obsession began. We then called it a night because we were in a major food comma state. 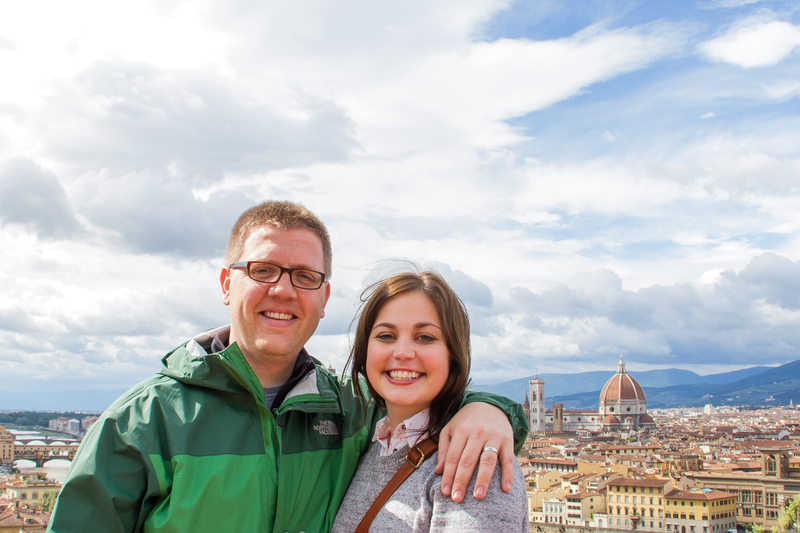 Then the time had come to say goodbye to our short time in Florence. 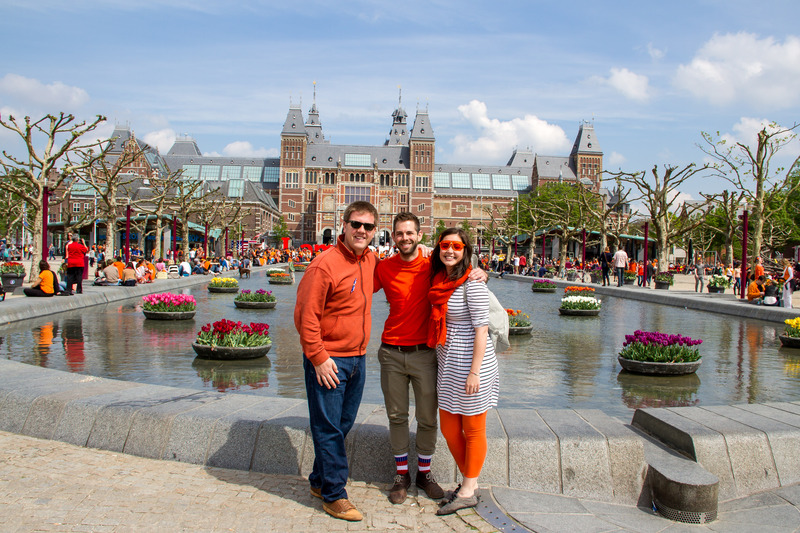 I wish would have had another day to get to some additional attractions, but I think we saw a lot of the city given our brief visit. 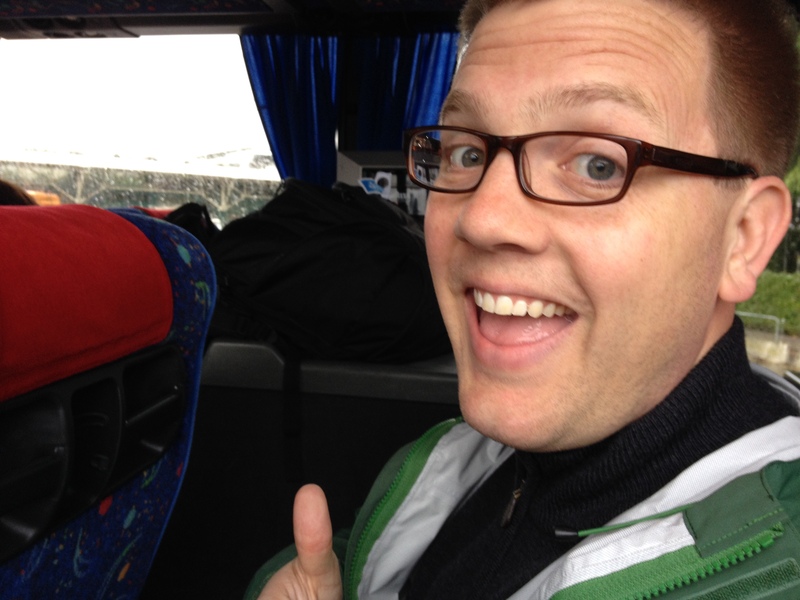 It was time for a 2.5 hour train ride to destination #2: Cinque Terre! A quick shout out to all the mothers (of humans or furry animal babies) out there who are constantly fulfilling one of the hardest and most stressful jobs! The world is a better place because of you. Great work!